An IRS audit is the stuff of nightmares. Most of us file our taxes every year in good faith, having included everything we know to include and providing the best representation of our income and our expenses. Yet we still worry that we will forget something or make some mistake that will leave us vulnerable to an audit. Others knowingly skirt the rules, hoping that the IRS won’t notice with all of the other returns it has to oversee. The organization has bigger fish to fry, right? It’s important to understand how omissions can lead to tax audits for years to come! Not necessarily. The IRS will audit anyone, and there are things you can do that will send up a big red flag and trigger an audit. Then you open yourself up to scrutiny for other years, and you may soon find yourself having to work with a Pardise Valley tax audit lawyer to keep yourself out of trouble. Typically, the IRS has three years to audit your return. The clock starts ticking when you file the return or when the return is due on April 15 — whichever comes later. You can’t file your return earlier to try to close out the statute of limitations earlier. You’ll only be adding a few months to your timeline. The time period doubles to six years if the IRS discovers that you omitted more than 25 percent of your income on your return. The six-year period also applies if you omit more than $5,000 of foreign income from your tax return. That means that all your tax returns in that time period are subject to an IRS audit, and you should be prepared to show documentation for all your income and receipts. If you don’t have it, you can face serious penalties, including paying back interest on the amount you are determined to owe. Working with a Paradise Valley tax audit lawyer can help you navigate the audit to minimize the risk of penalties. However, the best way to avoid these problems is to always be honest in your accounting and to work with tax professionals who can properly file your return. Understating your income is just one way that you can attract the attention of the IRS. You can also trigger an audit if you fail to file the appropriate forms. For example, if you do not file a Form 3520 documenting gifts or inheritance from foreign nationals or a Form 8938 for overseas assets, the clock will never start running on when the IRS can audit you. That means that you are leaving yourself open to audit in perpetuity — or at least until you file those forms. You can also face serious penalties if you don’t file certain forms. For example, if you don’t file a Form 5471 for your partial ownership of a foreign corporation as a shareholder, you can be fined up to $10,000. That fine is levied for each form you don’t file (for each company in which you own a stake as a shareholder). You will face that penalty even if you failed to file the form because no tax was due. In addition to facing the penalty, you also leave your return open to an IRS audit in perpetuity until the form is filed. The IRS can make adjustments to your return indefinitely until the form is filed. Always file all the forms you know are required. If you aren’t sure what you need to file, work with a tax professional who can help you cross all your T’s and dot all your I’s so that you don’t miss anything that could end up costing you big later. If you never file a return, there is no time limit on when the IRS can audit you. Similarly, if you never sign your return, it is not seen as a valid return and the clock never starts running on the audit window. That three-year statute of limitations only starts once you sign the return. The same is true if you alter the penalties of perjury language at the bottom of the return. The practical limit for most criminal or civil tax cases is six years. However, the IRS can actually audit you at any time if it suspects criminal violations or fraud, or if you failed to file a return. You can also be audited at any time if you fail to include an offshore account held by a company on your return. Some of the rules about the statute of limitations for IRS auditing were established in 2010 by the Foreign Account Tax Compliance Act, or FATCA. Other rules have long been in place. When you get the notice that you are being subject to an IRS audit, it is essential that you call a Paradise Valley tax audit lawyer right away. There are so many ways that you can make a mistake on a return, and you will pay for these mistakes with steep fines and even criminal penalties. You also open yourself up to more scrutiny, which can compound your penalties since it means that the IRS is likely to find other mistakes on other returns. 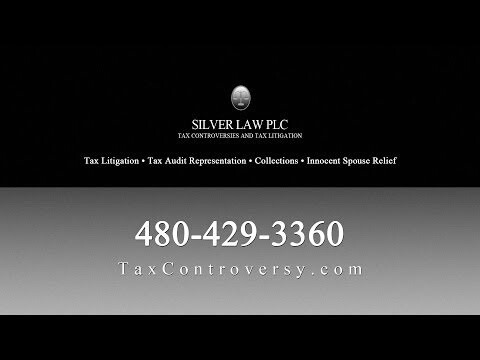 If you are being audited, you need to contact Silver Law PLC. An experienced tax audit lawyer from our team can represent you in the audit to help you minimize the fines and penalties you face. We may be able to adjust your return to find other deductions or to reduce your tax obligation, or we may be able to negotiate a settlement on your behalf. We represent individual and corporate clients in Paradise Valley and surrounding communities who are facing an IRS audit. Call us today to find out how we can help you.